If your kids are fans of Disney Junior, you are probably familiar with Jake and the Never Land Pirates, an animated TV series based on the famous children’s book/Disney franchise, Peter Pan. After airing for two seasons (with a new one to premiere later this year), the series has now gained an iPhone/iPad app: Jake’s Never Land Shapes and Patterns. As you may have guessed, this new app gets kids learning about shapes and patterns with Jake and his crew. Going with a learn-through-play approach, Jake's Never Land Shapes and Patterns is both an animated storybook and a game. The app offers three playing options: Read and Explore, Play Games, and Make Pirate Puppets. Ideally kids should start with the first option, but they can choose any one they like. In Read and Explore, kids get to join Jake, Izzy, and Cubby on their treasure hunt with Brightly the firefly. But mean Captain Hook has overheard their plans and wants to get the treasure for himself. 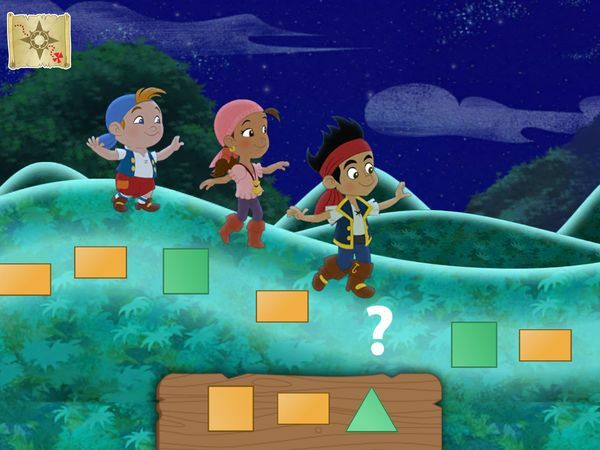 It is now up to your juniors to help Jake’s crew navigate through Never Land by going to all three spots on Cubby’s treasure map, and then participating in activities that test their understanding of shapes and patterns. For the first activity, Shadow Puppets, kids are asked to drag and drop drop shapes that match the silhouettes shown on a rock. The second activity, called Rolling Hills, sees kids completing patterns of shapes, for example, diamond - circle - diamond - circle - diamond - ?. In the third activity, kids can learn to draw shapes by tapping on Brightly and dragging him to connect a number of dots. Every time your juniors complete an activity, they earn a pair of pirate costumes for dressing up their puppets. 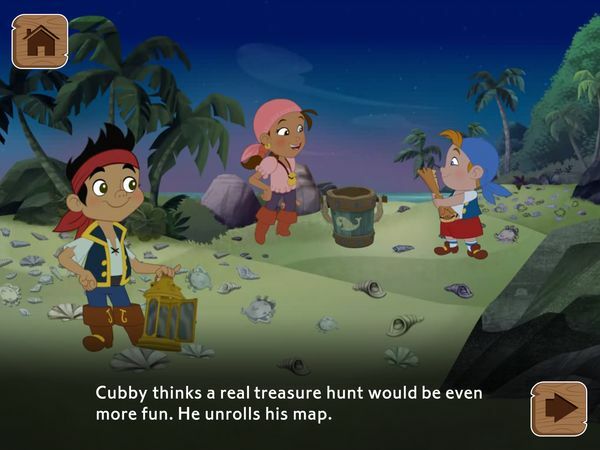 They also receive three shiny doubloons, which they collect by swiping across the screen. In addition to playing games, juniors can also find animated surprises throughout this fully-narrated story. Each interactive hotspot is marked with sparkles to make it easier to find. Once juniors are done reading the story, they can go back to the main menu and choose another playing option. Play Games is basically all three activities minus the story. Make Pirate Puppets is a simple dress-up game in which kids can pick a boy or girl pirate, use their own photo for the head, record silly pirate phrases, and watch as their puppet dance to pirate tunes. While Jake’s Never Land Shapes and Pirates is based on an existing TV show, I found that you don’t necessarily have to be acquainted with the series to enjoy the app. The story is simple enough for kids to follow, and it is clear which character is which. Reading skills are also not required as the app is fully narrated in English. As I’ve mentioned previously, the app has three activities. Interestingly, each activity comes with two difficulty levels, which the app automatically adjusts based on your juniors’ performance. For example, an easy problem in Rolling Hill game may look like this: circle - triangle - circle - triangle - ?. The difficulty problem is slightly more complicated, for example: triangle - triangle - square - triangle - ? - square - triangle. This adaptive difficulty level means that juniors should receive problems according to their skills. However, as parents you also have the option to set the difficulty levels manually by accessing the Parents section. This app does not contain in-app purchases. Ads are put away in a gated Parents section. I always expect high quality build and great entertainment value from Disney apps, and I am happy to report that Jake’s Never Land Shapes and Patterns is no exception. The graphics and animations are delightful; rather than reading a book, it felt like watching an animated feature instead. This effect is further enhanced because the characters are voiced by their original voice actors from the TV show. I also like the choice of activities that are included in the app. Surprisingly, they are quite challenging. I also appreciate that the games in Read and Explore and Play Games are not exactly the same. For example, in the Read and Explore version of Rolling Hill, the pattern is static on the screen. In Play Games, the pattern moves along the screen, so if you do not answer quickly then you will lose a chance for answering. This keeps the gameplay fresh and interesting. Jake’s Never Land Shapes and Patterns is a terrific app that teaches kids about shapes and patterns through a fun adventure and three leveled curriculum activities. As you would expect from a Disney app, the graphics and animation are delightful, and the narration top-notch. This is an app that I think many kids ages 3-6 would like, even if they are not yet familiar with Jake and his crew. Please note that this app is NOT compatible with iPhone 3GS, iPod Touch 3rd and 4th Generation, and iPad 1.